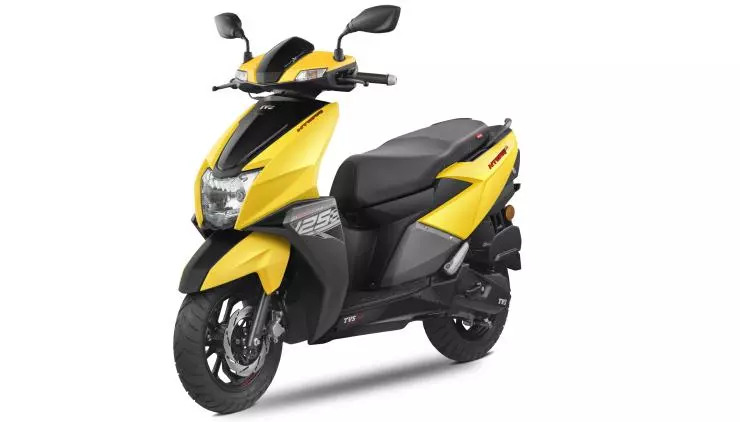 TVS launched their first 125cc scooter in the market in the form of NTORQ. The stylish performance scooter targets the young customers who want stylish looks with a good performance. That is a segment that even Honda Grazia targets and both of them have similar displacement engines. 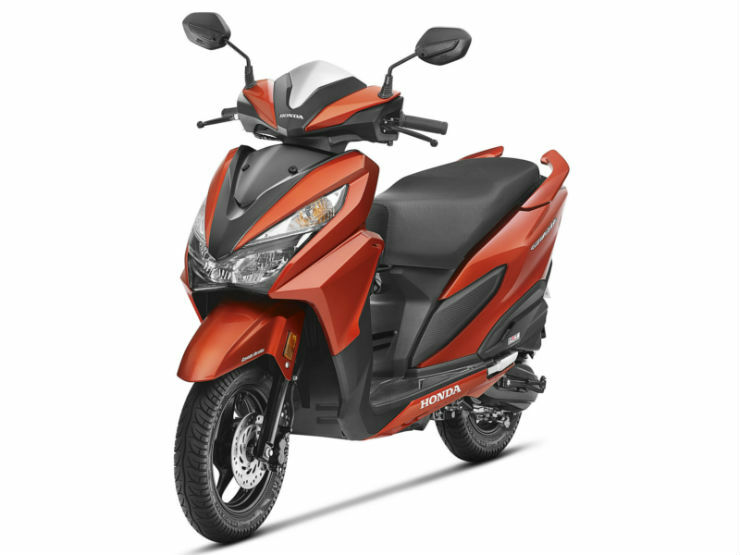 These are only sporty scooters in the segment at the moment. Which one looks better on paper? Let’s find out. The Japanese brand Honda has some really animated two-wheeler designs, especially in the Japanese market. The Grazia mimics similar, lively design in the form of scooters. The sharp looking scooter gets a lot of glass/plastic area in the front apron. There is a large headlamp with LED headlamp and two oversize indicators placed above it. The Grazia has a very sharp and busy design and one will find deep creases and protruding lines all over the body. The rear of the Honda Grazia also gets a lot of glass area. There is a huge glass case which has integrated tail lamp and turn indicators. It gets minimal sticker job and only gets the moniker stickers on the body. The NTORQ is bigger, wider and higher than the Grazia. It also gets longer wheelbase but the ground clearance stays the same. This is the most sporty scooter from TVS yet and it has sharp design too but overall the design looks less busy than the Grazia. The front gets a big headlamp and an LED DRLs placed below it. The fairing is layered and gets a dual tone. The NTORQ also has a very aggressively designed exhaust compared to Grazia’s regular looking muffler. The 12-inch alloy wheel design looks better on the NTORQ than the Grazia. 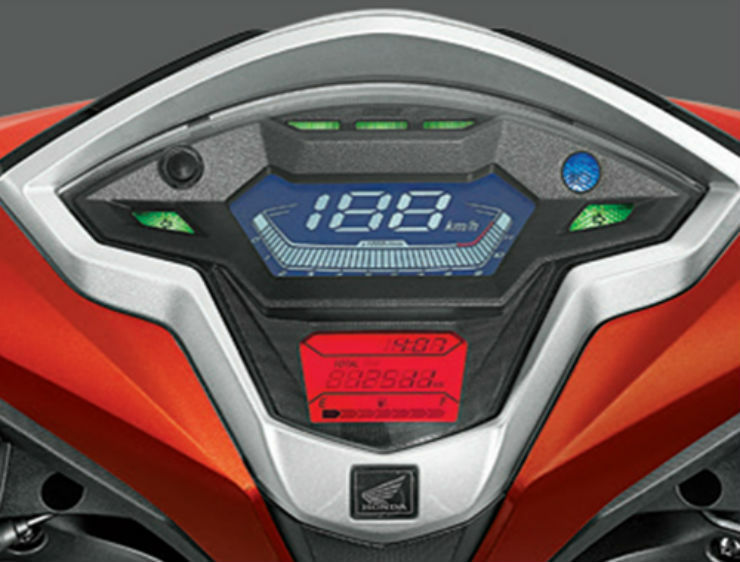 TVS also offers contrasting stitching on the countered seat of the scooter. The NTORQ gets 12-inch wheels at front and rear while Grazia gets 12-inch front wheel and 10-inch rear wheel. At the rear, the NTORQ gets LED tail lamp with a “Y” shape layout. the tail lamp gets faux air-scoops on both the sides adding a sporty look to it. There turn indicators are conventional ones and are not integrated into the tail lamp cluster. The TVS NTORQ gets 5.0-litre fuel tank while the Grazia gets 5.3-litre fuel tank. The NTORQ is powered by a new 124.7 cc, single-cylinder, air-cooled engine that generates a maximum power of 9.4 Bhp at 7,500 rpm and 10.5 Nm at 5,500 rpm. The scooter is claimed to be the quickest in the segment by TVS and can do 0-60 km/h in 9 seconds. 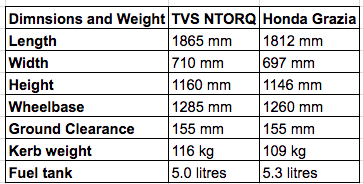 TVS also claims that the NTORQ can do 95 km/h, which is highest top speed in the segment. The Grazia is powered by a 124.9cc, air-cooled, single-cylinder engine that produces a maximum power of 8.52 Bhp at 6,500 rpm and 10.5 at 5,000 rpm. The scooter can go up to 85 km/h. Both the scooters get disc brake at front and drum brake at the rear. However, the disc brake is optional with the Grazia. The TVS NTORQ gets 220mm ventilated petal disc brake at the front while the Grazia gets a solid disc of 190 mm. The Grazia comes with the combi-brake system while there is no such feature in the TVS NTORQ. The Grazia also gets a full-LED headlamp, which is first in the segment while the NTORQ only gets LED DRL. 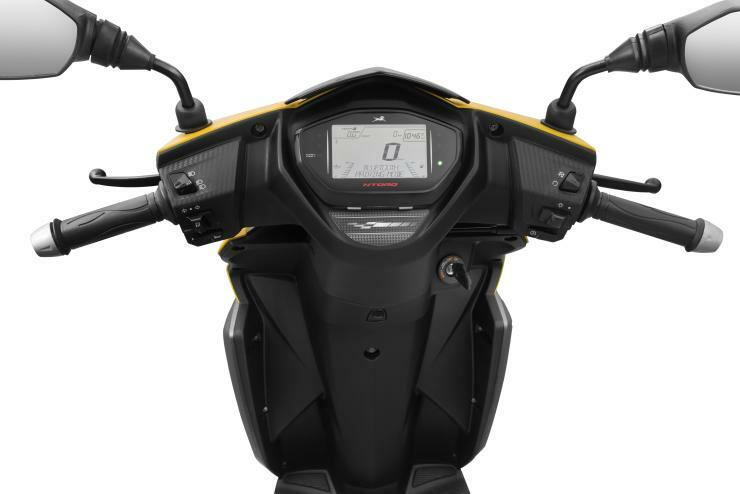 Both the scooters get full LCD instrument cluster but the NTORQ gets Bluetooth enabled console that can connect to a smartphone and show the caller’s name and turn by turn navigation too. It is the first Bluetooth enabled console available on a scooter in India.